Tom Hardy has emerged as one of the best British acting talents since his giant performance in ‘Bronson’, and his talent for mastering the voice of a character and even managing to gain and lose weight to almost ridiculous proportions, particularly in the case of Bane in ‘The Dark Knight Rises’, is testament to his conviction and determination in every role he plays. As a result, the idea of him being the only face we see for an hour and a half isn’t anywhere near as ridiculous a prospect as it might be for someone else. 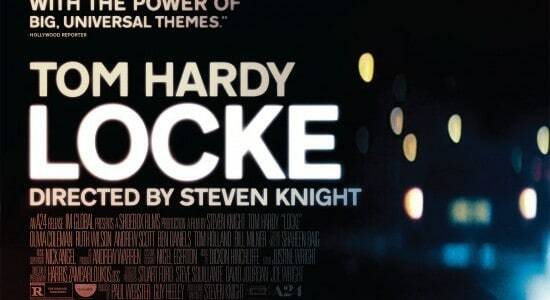 That is what he’s tasked with in ‘Locke’, the new film by Steven Knight, known in the film world for writing Stephen Frears’ ‘Dirty Pretty Things’ and David Cronenberg’s ‘Eastern Promises’ but here trying something quite revolutionary, an exercise in minimalist film-making that needs to be judged perfectly to work at all. Thankfully Knight’s script is engaging, clever and always gripping, and when put together with one of Hardy’s greatest performances makes for a film that latches on at the beginning and refuses to let go until the end. Indeed, Hardy’s role as hardworking family man Ivan Locke begins unassumingly, but quickly evolves in to a powerful and intense role that demands a lot of him, particularly when all we’re focused on for the film’s 85 minute running time is his facial expression, his tone of voice and how he reacts to the events that occur on a rollercoaster drive down from Birmingham to London that turns out to be as tense as any more conventional thriller. There are absolutely no slip-ups on his behalf, and to maintain that quality of performance is quite remarkable in the circumstances. It’s hard to come up with many better character actors than Hardy, and in that respect Knight was lucky that he could get him to bring life to his equally ingenious writing. Commendations must also be given to a strong voice cast, from Andrew Scott to Ruth Wilson to Olivia Colman, all of whom work as great foils for Hardy to work from, even if it is just their voices providing him with the fuel. No matter how sceptical one could be about the film’s premise, and maybe it does sound unbelievable that a film about a man driving a car down a motorway could be as engaging as this one is, it’s something that must be believed. It gradually coaxes and nudges you towards believing that it’s a masterpiece of tight-knit writing, direction and exemplary acting, a triumph that shows that minimalist cinema of this type can provide just as many thrills as anything else with almost none of the budget. ‘Locke’ is a baffling, beguiling, bold and befuddling success that deserves to be watched and commended for all its masterful intensity.